The story of the Great Irish Famine, through the eyes and memories of the Irish people. This book tells how they lived, why their lives depended on the potato, how they dreaded the workhouse, how they feared and defied the landlords who collected the rent and evicted them, how the Famine began, and why it was so horrifyingly, devastatingly deadly. Turn-of-the-century mining life was marked by deplorable working conditions, squalor, and the ever-present dangers of the occupation. But the story that emerges is not just a story of long hours, little pay, and hazardous work; it is also the story of immigrant families working together to make a new life. It is a story of hardship and sacrifice, yet also of triumph, hopes, and dreams. This biography of Mary Mallon looks beyond the tabloid scandal of her life. How she was treated by medical and legal officials reveals a lesser-known story of human and constitutional rights, entangled with the science of pathology. How did Mary's name become synonymous with a deadly disease? And who is responsible for the lasting legacy of Typhoid Mary? “Boys, let us get up a club.” With those words, six young men pulled pillowcases over their heads, hopped on horses, and ran through the streets of Pulaski, TN. They named their club the Ku Klux Klan, and it grew into a self-proclaimed Invisible Empire with secret dens spread across the South. This is the chilling story of how a secret terrorist group took root in America’s democracy. It began with the best of intentions. Worried about the effects of alcohol on American families, mothers and civic leaders started a movement to outlaw drinking in public places. Over time, their protests, petitions, and activism paid off―when a Constitional Amendment banning the sale and consumption of alcohol was ratified, it was hailed as the end of public drunkenness, alcoholism, and a host of other social ills related to booze. Instead, it began a decade of lawlessness, when children smuggled (and drank) illegal alcohol, the most upright citizens casually broke the law, and a host of notorious gangsters entered the public eye. History comes to vivid life in Fleming’s sweeping story of the dramatic decline and fall of the House of Romanov. Her account provides not only intimate portraits of Tsar Nicholas; his wife, Alexandra; and the five Romanov children, but it also offers a beautifully realized examination of the context of their lives — Russia in a state of increasing social unrest and turmoil. Instead of attempting to reform this, Nicholas simply refused to acknowledge its presence, rousing himself only long enough to order savage repression of the occasional uprising. The end, when it came, was swift and terrible. In 1943, an American military plane crashed into the Pacific Ocean and disappeared, leaving only a spray of debris and a slick of oil, gasoline, and blood. Then, on the ocean surface, a face appeared. It was that of the plane’s bombardier. So began one of the most extraordinary sagas of the Second World War. Driven to the limits of endurance, Louis Zamperini would respond to desperation with ingenuity, suffering with hope and humor, brutality with rebellion. His fate, whether triumph or tragedy, would hang on the fraying wire of his will. From the boys who sailed with Columbus to today's young activists, this book brings to life the contributions of young people throughout American history. Read the stories of people like Olaudah Equiano, kidnapped from his village in Africa and forced into slavery; Anyokah, who helped her father create a written Cherokee language; Johnny Clem, the nine-year-old drummer boy who became a Civil War hero, and Jessica Govea, a teen who risked joining Cesar Chavez's fight for a better life for farmworkers. One hundred years ago, a mysterious and alarming illness spread across America's South, striking tens of thousands of victims. No one knew what caused it or how to treat it. People were left weak, disfigured, insane, and in some cases, dead. This is the story of the 4,000 black students who voluntarily went to jail in Alabama in 1963. Fulfilling Gandhi and Dr. Martin Luther King, Jr.'s precept to fill the jails, they desegregated the most racially violent city in America. A detailed account of the disastrous Triangle Shirtwaist Factory fire in New York City, which claimed the lives of 146 garment workers in 1911. This book examines the impact of this event on the nation's working conditions and labor laws. In answer to Hitler's Holocaust, the only response the Jewish men and women described in this book could abide was resistance, and their greatest weapons were courage, ingenuity, and the resolve to save others or to die trying. In 1938, a chemist made a discovery: When placed next to radioactive material, a Uranium atom split in two. discovery launched a scientific race that spanned 3 continents. This is the story of the plotting, the risk-taking, the deceit, and genius that created the world's most formidable weapon -- the atomic bomb. In 1875, master counterfeiter Ben Boyd is hauled off to prison. Members of his counterfeiting ring gather in the back room of a Chicago saloon to discuss how to spring their ringleader. Their plan: grab Lincoln's body from its Springfield tomb, stash it near Lake Michigan, and demand, as a ransom, the release of Ben Boyd --and $200,000 in cash. This book presents an account of the 1944 civil rights protest involving hundreds of African-American Navy servicemen who were unjustly charged with mutiny for refusing to work in unsafe conditions after the deadly Port Chicago explosion. One man, President Lincoln, assassinated, on his way to the grave. Another man, the president of the Confederacy, Jefferson Davis, on the run, soon to be sent to prison. Their actions forever changed the history of a nation. When the Union blockade of all ports in the South stopped supplies from reaching the Confederate Army, Horace L. Hunley decided to create a submarine that would be able to sneak up on enemy ships and blow them up. 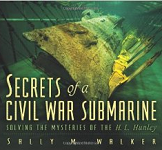 After many years of trial and error, the H. L. Hunley actually succeeded in sinking the USS Housatonic in February of 1864. But the submarine never returned to port, and her crew perished in the Charleston Harbor. How did the colonists of Jamestown and Maryland live and die? Forensic anthropology provides an incredible array of answers. Scientists can look into a grave and determine the skeleton's gender, age at time of death, nationality, and sometimes even economic standing within minutes. Laboratory studies can provide cause of death information. Once these details are known, some skeletons can even be matched with a name via the historical record.